**Please see my update at the bottom of my old review. My twin 9-month olds, like all babies of that age, love to show when they’re displeased by throwing something. When they try that with the Bendy Ball, most of the time they forget why they got upset. This cute thing can be bent while holding and you can put your fingers inside it. Plus the ball inside that you can’t quite get out has a little ball inside it that sounds like a bell almost. If you want to throw it to show your displeasure at something, you’ll end up putting your fingers into it first. Those distractions are priceless. By the time baby finally rolls this ball, it is with a positive frame of mind, and she wants it back to try again. I can see that this durable little toy is going to be used in many ways and constantly. It’s a lot of fun to roll their way and see how they try to figure out what to do with it. Beyond that, the colors are great. The 5 outer caterpillar parts on diameter are cute. I think this is an educational toy that teaches about hand manipulation. Wow, has this toy changed! One look at the photo and it’s obvious it changed. It now looks like a cheap hard plastic with a shiny surface and less intricate shape. What I got and my girls enjoyed back in 2009 was a denser non-reflective rubber-like toy that wouldn’t hurt if it were thrown by one toddler at another. My twins threw it at each other and nobody cried. I had this at 5-stars because it deserved it at that time. This video highlights the features of the bendy ball that you can’t see in the photos. 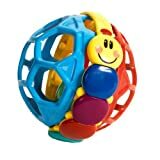 A mom in my group had a similar one of these for her baby who just loved it. So when we were walking through the baby aisles at Target, we saw this one and just put it in the stroller with our baby to see if he would like it–and he played with it the entire time! So, of course, we bought it! He has many other rattle-type toys meant for grabbing, but this is the first one he has actually grabbed on to and played with. It is very sturdy and actually a little heavier than I anticipated by just looking at it–I was worried it might be too heavy for him to pick up (since we had never really seen him pick up anything before) but he manages with no problems!